The Southern Hills Arts Council is excited to announce that the Markay Cultural Arts Center will now be able to show motion pictures. A generous donation funded the electric roll down 24 foot by 10 foot, 6 inch screen and the digital cinema projector. The new equipment will also facilitate the ability for meetings to take place in the Markay’s auditorium with connectivity to broadcast presentations on the screen. A generous donation funded the electric roll down 24 foot by 10 foot, 6 inch screen and the digital cinema projector. 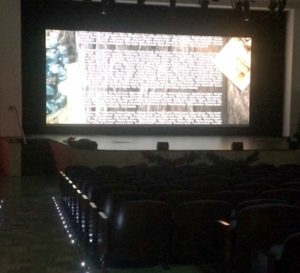 “The new equipment will also facilitate the ability for meetings to take place in the auditorium with connectivity to broadcast presentations on the screen,” said Southern Hills Arts Council Director of Operations Jennifer Hughes. Movies at the Markay will first be shown on Saturday, February 11 at 3 and 7 p.m. Hughes explained that the classic movie that will be shown is one of the most memorable of all film experiences, a true Hollywood legend. Hughes said “Casablanca” is about wartime refugees who gather in Morocco to obtain scarce exit visas to Lisbon. The final airport sequence is an event not to be forgotten. Humphrey Bogart and Ingrid Bergman fans will not want to miss this event. Tickets for the movie are on sale now for $5. Hughes said that through partnership with local businesses, Elizabeth’s Flowers and Michael’s Ice Cream for an additional $15 the Sweetheart Special is available for advance purchase, which includes a single red rose, roasted peanuts and assorted chocolates. Those attending the first Movies at the Markay event, will get 10% off their meal (excludes alcohol) at Arch and Eddie’s (181 E. Main St., Jackson) on Feb. 11, 2017 only, when they show their movie ticket. Concessions, including authentic movie theatre popcorn, from TriCity Theater will be available. Tickets can be purchased in advance by visiting www.markaytickets.org or calling the Walnut Hills Neighborhood Box Office at the Markay at 740-577-3841 or by stopping by the box office, 269 E. Main St., Jackson, Ohio Wednesday to Friday noon to 5 p.m. or before performances on Jan. 28, Feb. 3 or Feb. 10.